Also serving communities of Round Lake Beach, Lindenhurst. There are 18 Assisted Living Facilities in the Grayslake area, with 2 in Grayslake and 16 nearby. The average cost of assisted living in Grayslake is $3,975 per month. This is higher than the national median of $3,346. To help you with your search, browse the 123 reviews below for assisted living facilities in Grayslake. On average, consumers rate assisted living in Grayslake 4.0 out of 5 stars. Better rated regions include Gurnee with an average rating of 4.2 out of 5 stars. Caring.com has helped 5 families in Grayslake find high-quality senior care. To speak with one of our Family Advisors about assisted living options and costs in Grayslake, call (855) 863-8283. Grayslake, a village in Lake County located in the Chicago metropolitan area, has a senior population of 8.3 percent. The Grayslake area has 40 assisted living facilities, with two in Grayslake itself and another 38 in nearby areas such as Gurnee and Long Grove. The Department of Health regulates assisted living facilities for seniors in Illinois, which it describes as "assisted living and shared housing establishments." These facilities provide help with daily living, including eating, grooming, medication reminders and general care. Grayslake is located in Lake County and is part of the Chicago metropolitan area. Like other parts of this metropolitan area, seniors may find it inconvenient of go outdoors during the winter. The average high in January is 31 degrees in Grayslake, and the average low is 17 degrees. The weather is warmest in July, which has an average high of 84 degrees and an average low of 64 degrees. The overall cost of living in Grayslake is relatively high at 8.8 percent above the national average for the United States. All expenses are above average, and transportation is the highest relative expense at 23 percent above average. Seniors will therefore need to budget more carefully for transportation. Grayslake has a moderate overall crime rate for the United States and is safer than 40 percent of the cities in the United States. However, the annual rate of violent crime in Grayslake is quite low at 1.25 per thousand people, compared to an annual rate of 4.36 per thousand people for Illinois. Seniors in Grayslake should feel safer than in many other cities. The Division of Transportation provides paratransit services specifically for senior citizens and the disabled in Lake County. Senior citizens must be at least 65 years of age to qualify, and people with disabilities must be so certified by the regional transportation authority. The fare is free and covers service within 0.75 mile of local fixed routes. The Grayslake Senior Center provides a variety of recreational activities for seniors in Grayslake, including bridge, bingo and yoga. It also holds classes in kitting, yoga and crochet. The senior center is jointly managed by the village of Grayslake and Catholic Charities. The Grayslake area is home to world-class medical facilities, including Northwestern Grayslake. Assisted Living costs in Grayslake start around $3,975 per month on average, while the nationwide average cost of assisted living is $4,000 per month, according to the latest figures from Genworth’s Cost of Care Survey. It’s important to note that assisted living rates in Grayslake and the surrounding suburbs can vary widely based on factors such as location, the level of care needed, apartment size and the types of amenities offered at each community. 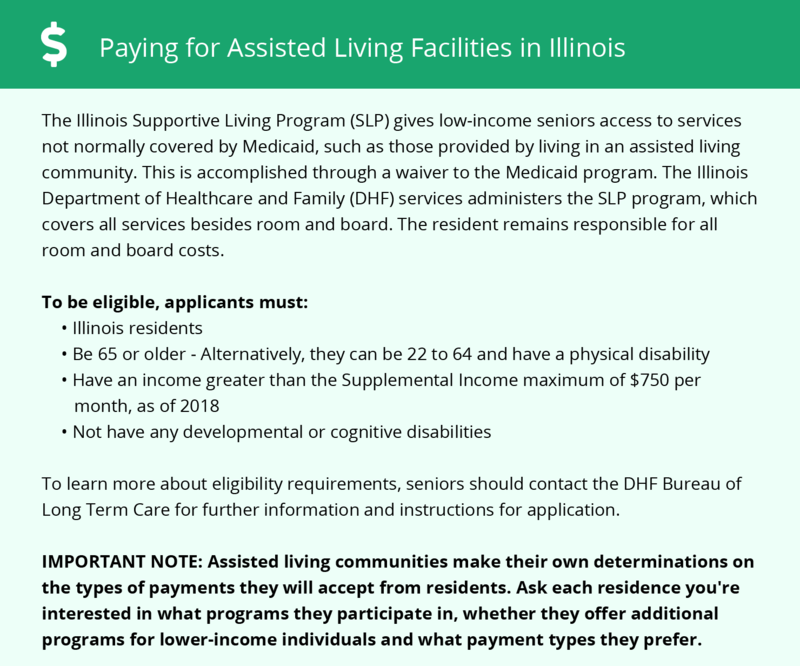 Illinois has nine waiver programs for many home and community based services that include assisted living. These programs are tailored for a variety of specific needs. Grayslake and the surrounding area are home to numerous government agencies and non-profit organizations offering help for seniors searching for or currently residing in an assisted living community. These organizations can also provide assistance in a number of other eldercare services such as geriatric care management, elder law advice, estate planning, finding home care and health and wellness programs. To see a list of free assisted living resources in Grayslake, please visit our Assisted Living in Illinois page. Grayslake-area assisted living communities must adhere to the comprehensive set of state laws and regulations that all assisted living communities in Illinois are required to follow. Visit our Assisted Living in Illinois page for more information about these laws.